In parenting, there is so much information, but so little consensus. Still, whether you helicopter or free range, install blackout shades or blow through naps, serve vegan grain bowls or Coco Krispies, it’s the rare parent who doesn’t adhere to at least some of the American Academy of Pediatrics’ guidelines (and by “adhere,” we mean have a passing awareness of them so we know when to feel extra guilty). And now, in addition to advising us on when we should introduce solids and how many hours of sleep kids need, we’ve learned the AAP has thoughts on how old our kids should be before they try out some independence, like walking to school on their own or even crossing the street solo. Their conclusion? Age ten at the earliest. This information comes via a fascinating Wall Street Journal article called “The Overprotected American Child.” The gist, per author Andrea Petersen: “Overzealous parenting can do real harm. Psychologists and educators see it as one factor fueling a surge in the number of children and young adults being diagnosed with anxiety disorders.” The real heartbreaker? 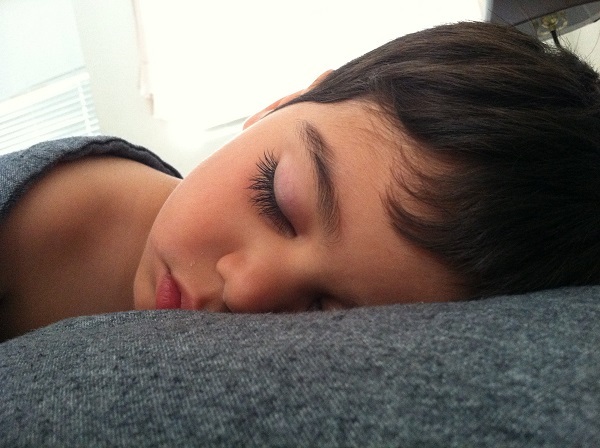 “For children who are already anxious, overprotecting them can make it worse. ‘It reinforces to the child that there is something they should be scared of and the world is a dangerous place and I can’t do that for myself,’ says Rebecca Rialon Berry, a clinical psychologist at the NYU Langone Child Study Center.” The antidote, say the experts? More autonomy. And, to that end, it turns out crossing the street without an adult’s help is a major milestone marker. Still, when it comes to the maturity, danger awareness and traffic savvy it takes to navigate a crosswalk, researchers caution that even some ten-year-olds may not be up to the task. Bottom line? You know your kid best. After studying a range of age groups, the AAP concluded: “Development of pedestrian skills was highly variable such that a few of the 5-year-olds did better than some 11-year-olds on the overall pedestrian skills score.” So guidelines aside, it’s still a parent’s job to figure out where on the capability continuum their child sits (or rather, walks). It’s back-to-school time. While this means getting back to learning and reconnecting with friends, parents everywhere know that kids are basically walking garbage cans, and schools are where they gather close together and spend hours of time sharing their space — and their germs. Of course, they then come home and happily share their germs with the rest of the family, including their parents. So, how can parents boost their immune systems and prevent themselves from getting sick when the kids go back to school? Here are some top tips for boosting your immunity. When it doubt, wash your hands. “Wash your hands as often as possible for at least 20 seconds with warm water and soap,” Dr. Kristine Arthur, an internist at MemorialCare Orange Coast Medical Center in Fountain Valley, California, tells SheKnows. While washing hands is mostly about keeping germs out of your body, it’s still a super-important habit to get into as fall and winter roll around, and if you can keep those germs away, you’ll be way better off when your kids start bringing viruses home, she says. Moving around more while you work (especially if your job is sedentary) can help your overall general health and can keep your immune system in tip-top shape, Arthur says. She suggests squeezing in a walk as often as you can, parking farther away from your building and taking the stairs. “If you are able to stand up while typing, try to do it as much as possible, as studies show that prolonged sitting every day can be as bad for you as smoking,” she explains. Dr. Christopher Hollingsworth, a surgeon at NYC Surgical Associates, suggests adding a few vital nutrients to get your immune system at its best. “Oysters are very high in zinc, which is utilized extensively by your body to produce all the biochemicals needed to fight infection,” he tells SheKnows. Pumpkin seeds are an excellent snack food that is high in zinc and in antioxidants — and taste great toasted and salted, he adds. Physical activity can help boost your immune system, but excessive or repeated strenuous exercise can dampen your immune system, as shown in a study published in the European Journal of Sport Science in 2018. If you love garlic, your immune system is in luck. “Garlic influences your immune system to fight infection aggressively as well as reduce inflammation,” Hollingsworth explains. Ah yes, that good old vitamin C. Turns out it’s not only in some of your favorite foods, but it’s excellent for your immune system. Even just reading this will probably make you want to touch your face. But don’t. Emergency physician Dr. Chirag Shah tells SheKnows that we shouldn’t touch our eyes or face throughout the day or at least wait until we have freshly washed hands and should teach our kids to do the same. “One good way to increase the risk of getting sick is touching something dripping with infectious droplets and then sticking the droplets right into your eyes or nose,” he explains. Ick! You don’t really have to subject your kids to a decon shower, but Arthur suggests having your kids wash their hands immediately after coming home from school, and you might even consider having them change into clean clothes once they walk through the door. It seems inevitable that once your little germ magnets go back to school, they’ll eventually bring home some germs to share with you and the rest of your family. While it’s a good idea to keep the above tips in mind, frequent handwashing is so vital — especially before you sit down and eat food. So wash up, parents! And keep your kids on a steady diet of handwashing too. Hopefully, you’ll keep those back-to-school germs far away. In today’s world, we worry more about fitting in than sticking true to ourselves. Peer acceptance is an especially strong concept among young children. When children are starting school, their priority and the thing they may fear the most is simply making friends. Instead of wearing their favorite shirts and risk having other children make fun of them, our children may be holding back and wear something less themselves to fit in with others. Instead of sharing their favorite movie, they may give in and share a friend’s favorite movie so no one laughs at their opinions. It’s important for our little ones to understand that they are talented and what they like or dislike does matter. Their other opinions matter too. 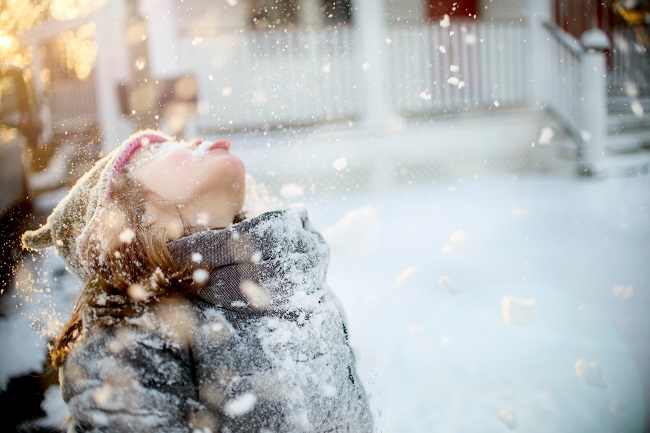 Our children should feel comfortable expressing themselves; just as each snowflake is unique, so is each child different from the others. 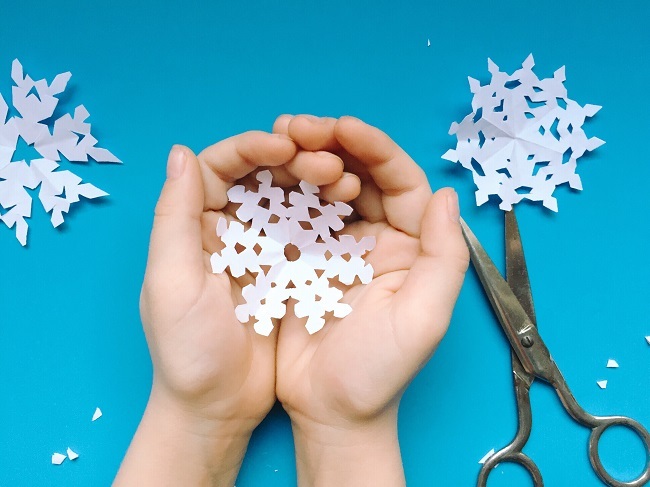 Completing a snowflake activity is a good way to explain this concept. Gather a stack of white computer paper and cut each sheet to form a perfect square. Once in a square, fold the paper diagonally and then diagonally another three times. Next, cut the tip off, cut out shapes and slits in the paper and then unfold for the final product. Repeat and see how each snowflake is different from the others while each snowflake is itself beautiful. We see that no two snowflakes are the same. It’s similar with people; even twins are not exactly the same. Teach your children that it’s okay to be different and to be confident in being different. Your children are more likely to become leaders when they’re confident in themselves, their likes, their dislikes and their overall decisions. What are some ways your children openly express themselves?